Moatt sails recently gained the ability to offer membrane sails to our racing customers, particularly those who are looking to get the strength to weight advantages that these sails offer. I was asked to look at a boat owners sail inventory and recommend a sail that would improve his boats light airs performance without impacting the rating. A membrane sail could well fit the bill but as I was completing the proposal I was reminded of a moment early in my sailmaking career which I thought you might be interested in….Well, you might….! Whilst competing in the Round Britain and Ireland double handed race of 1989 I was talking to a young lady at the Lerwick boat club during the 48 hour stop over. She was very attractive and training to be an architect so naturally I was trying to impress. When she asked what I did for a living I said “I’m a sail designer”. In hindsight, and knowing that she was a trainee architect, I should have been less showy and just said Sailmaker but I thought the word designer lent me a bit of a cachet. A moment of two of uneasy silence followed until she simply turned to a nearby table, took a canapé and elegantly moved on. Ah well. It was one of those ‘Life Lesson’ moments that could have gone either way. I had to either improve my chat up lines or, as I decided, take sail designing a bit more seriously. And so it was that I went on to learn as much as I could about sail design from as many people who would tell. I became a better sail designer but it was little while before I was confident enough to try my smooth talking chat up lines again. So back to the proposal. Being a modern IRC style sports boat it was clear that increasing the area of the genoa was not an option if the rating is to remain unchanged. Examining a photograph of the AP genoa showed that this is probably good from 8 knots but was probably too flat for lower wind speeds. So I was left to look into making a new sail which is physically lighter and shaped to perform in an apparent wind range of 3 to 8 knots, with the inherent strength to be usable in 10 knots, ensuring the cut over point to the All Purpose genoa is not unreasonably critical. Looking at the existing wardrobe it was clear that there was too much of a gap between the conventional light genoa and the All purpose genoa. Also the light genoa was very flat in the lower third and probably would not produce the required drive in 5 knots. Also, the entry was quite straight which means it has a narrow “groove” making it quite sensitive to steer to aswell, particularly unhelpful in lighter conditions where the helm wants to use as little rudder as possible. To meet the strength / weight requirement was always going to be a challenge and is classically achiieved by using differing weights of cloth in a paneled sail with a radial layout. This option which serves well but has a down side in the potential for distortion where the differing cloth weights meet. This lead me to conclude that this could be the perfect place to employ a membrane. 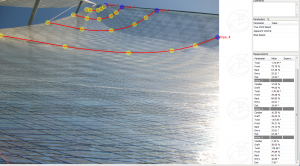 Recent improvements in the lamination of membrane sails has opened up a great opportunity to create a sail which is stronger and lighter than a paneled sail and does not suffer from the step change in weights or the delamination problems associated with membrane sails of the past. Decision made I designed the camber profile to be generally a bit deeper with a fuller entry. This sail shape will increase the power produced but will not require super accurate angle of attack, thus allowing the helm to steer gently, taking his time and using minimal rudder movement. The trimmer will of course “fan sheet” by easing the sail as the boat sails into a lift, and sheeting in gently at the skipper brings the boat up onto course. To help this, the fuller head will prevent the upper leech from opening too much and maintaining drive during the process. 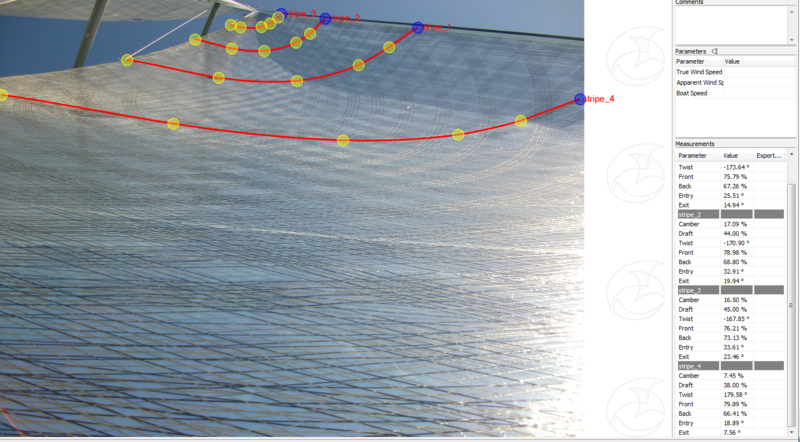 From a construction perspective, having no radial seams means that the membrane sail is smoother than its conventional paneled counterpart and another huge advantage of our membrane sails is the way that the corner reinforcement can be laminated into the body of the sail. In this way load is transferred more smoothly from the corners into the sail body and there is no hard spot or ridge where the patches end. There have been huge improvements in the lamination process which could be a point of failure in previous laminated sails where an excess kevlar thread converged at a corner. For advice on chat up lines……Hmmm. Not really able to help there.